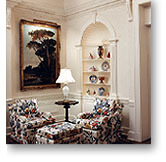 P & T Millwork, custom moldings and trims to meet interior and exterior millwork needs. 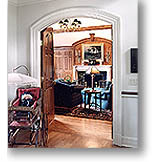 A key to elegance in a well designed home or office is the proper proportion and style of trim. Whether meeting architectural specifications or matching existing trim, we will manufacture custom moldings to fit your needs. Accessory trim such as plinth blocks, brackets, and key blocks are also made to order. Do you need a special species of wood? Are windows or doors arched? Is the room round? We manufacture trim for all of these conditions. Chances are we have the trim profiles your job requires. If we don't, we'll be glad to grind knives to your specifications. P & T sales representatives are experienced in classic trim applications. They can assist you with detailing your interior and exterior millwork to produce an overall project that is truly special.